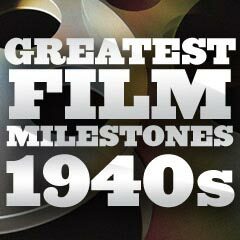 1945 At the conclusion of the war, the federal government ended restrictions on the allocation of raw film stock, midnight curfews, and bans on outdoor lighting displays as well as censorship of the export and import of films. 1945 Roberto Rossellini's influential landmark film Open City (1945, It.) formally introduced Italian Neo-Realism, marked by a gritty, authentic and realistic post-war film style. Characteristics included the use of on-location cinematography, grainy low-grade black-and-white film stock and untrained actors in improvised scenes. The socially-aware, documentary-style film captured the despair and confusion of post-World War II Europe. [Another film that provided a seminal example of this post-war style was Vittorio De Sica's The Bicycle Thief (1948).] Italian Neo-Realism, portrayed by film-makers Rossellini, Luchino Visconti and Vittorio De Sica, lasted until 1952. It would have a tremendous influence on the development of future 'avant-garde' films with intense character studies (i.e., surrealistic cinema from Federico Fellini and Michelangelo Antonioni, cinema verite, the French New Wave and the maverick films from the New Hollywood). 1945 The Screen Extras Guild (SEG), a union representing the interests of persons regularly cast as extras, was organized. 1945 In a major victory for actors, the Supreme Court handed down the so-called "de Havilland decision," declaring that studios may hold contract players no more than seven years. Actress Olivia de Havilland had sued Warner Bros. in 1943 for extending her contract beyond its seven years. 1945 Paramount's (Famous Studios) animated cartoon The Friendly Ghost (1945) marked the first appearance of an amiable apparition named Casper on movie screens. The cartoon was part of its Noveltoon series of animated shorts. Cecil H. Roy provided Casper's voice. The next Casper cartoon appeared a few years later - There's Good Boos Tonight (1948). 1945 Animated cartoon character Sylvester the Cat (originally called "Thomas"), and famous for his lisp and trademark: "Thufferin' Thuccotash! ", made his film debut in Life with Feathers (1945). Sylvester's first film with yellow Tweety Bird was Tweetie Pie (1947). 1945 'Has-been' star Joan Crawford, who had developed a reputation for being mannered and difficult (and had been let go two years earlier by MGM for a slumping decline), pleasantly surprised everyone at Warners when she delivered one of the best performances of her career in Mildred Pierce (1945). In an astonishing comeback part (and debut role for Warners), Crawford won the film's sole Academy Award Oscar (it was also her sole Academy Award win out of three career nominations) - Best Actress. 1945 The Motion Picture Producers and Distributors of America (MPPDA), created by major US film studios in 1922 to police the industry, was renamed as the Motion Picture Association of America (MPAA). It was responsible for implementing the voluntary film rating system. 1945 The House Un-American Activities Committee (HUAC), an organization created in 1938 with the goal of domestically stopping subversive activities, un-Americanism and communism, was made into a permanent standing committee under Congressman John Rankin (of Mississippi). By 1947, the Hollywood motion picture industry became one of its main targets when the committee initiated an investigation of Communist influence there. 1945 Marcel Carné's three-hours in length French resistance romantic classic The Children of Paradise (1945, Fr.) (aka Les Enfants du Paradis) premiered in Paris, France. It was made during a time of Nazi occupation in France, and filmed in secret over an 18-month period. At around $1.5 million, it was the most expensive French film ever made, and its length required that it be divided into two parts (with two separate sets of credits). It has often been dubbed "the French Gone With the Wind." 1945 Pathe newsreel footage of the liberated German concentration camps was released - Radio City Music Hall declared it "too gruesome to be shown at a family theater." 1945 The rarely-seen film Momotaro: The Holy Soldier of the Sea, financed by (and starring) the Japanese Imperial Navy and directed by Mitsuyo Seo, was the first feature-length anime film ever made. The unique art form of anime films from Japan, characterized by stylized colorful graphics depicting vibrant characters in fantastic or futuristic action-filled plots, would become increasingly popular in the 1980s. 1945 One of the earliest (if not the first) Hollywood film to feature the use of judo (martial arts) in fight sequences was in Blood on the Sun, starring James Cagney as an American newspaper editor who exposed militaristic plans for Japanese expansion. 1945 The first of three films director Alfred Hitchcock made with star Ingrid Bergman was Spellbound (1945), followed by Notorious (1946) and Under Capricorn (1949). 1945 Edgar Ulmer's film-noirish Detour (1945) was the first "poverty row" (B-movie) and Hollywood 'noir' chosen by the Library of Congress (the National Film Registry) for preservation in 1992.